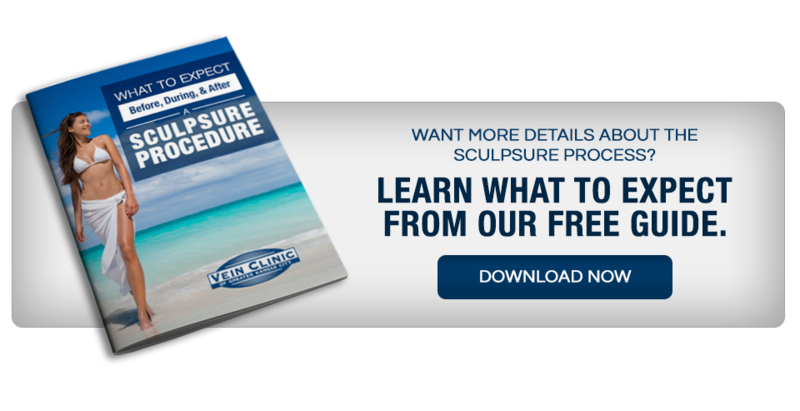 Maybe you’ve heard about SculpSure, the fat melting treatment that uses lasers to target those hard-to-lose areas of fat on your body. Sounds great doesn’t it? Maybe you’ve been considering it, but there’s one big question you still have…does it hurt? Fair question. Let’s see what people who have had the procedure have to say. First things first, what exactly does the procedure entail? With SculpSure, targeted laser energy heats fat cells under your skin without harming your skin’s surface. Raising the temperature of the individual cells damages their structural integrity. Over the next 12 weeks or so, your body’s lymphatic system will process and eliminate them from your body. That’s it – the fat cells are permanently removed and won’t regenerate. No one likes pain, so one of the questions we hear most about the procedures we do at the Vein Clinic – varicose and spider vein treatments and various aesthetic procedures – is, “Will it hurt?” Of course, we’d like to tell you every one of our treatments is totally pain-free, but that’s not always the case. Luckily for those patients considering SculpSure, the answer is easy! Find out what it feels like to be on the receiving end of our body contouring treatment. SculpSure uses a laser to damage and destroy fat cells. The heat of this laser is balanced out by the SculpSure system’s cooling element. While the equipment is constantly cooling your skin throughout the treatment, the heat of the laser varies. Because your body can only interpret so much information at one time, patients report alternating heating and cooling sensations during their treatment. A common description is that “pins and needles” sensation we’ve all felt when we’ve slept on an arm wrong, or crossed our legs for too long. Generally, patients say the procedure was only moderately uncomfortable at times, and usually less painful than other cosmetic procedures. Plus, the good news is that this particular treatment only takes about 25 minutes to complete, so any minor pain is definitely short lived! Because each one of us has a different level of pain tolerance, it’s impossible to answer this question for everyone. While most of our patients only experience very mild discomfort, there is some wiggle room if you find the procedure to be too uncomfortable. Knowing that we can reduce the intensity of the treatment, to an extent, while still maintaining its effectiveness usually puts our patients’ minds at ease. If you’d like to learn more about SculpSure, call the Vein Clinic of Greater Kansas City at (913) 541-3377. Dr. Barbieri and his staff will be more than happy to answer your questions and concerns! This entry was posted in Treatments by Dr. Craig Barbieri. Bookmark the permalink.